Innovation action-lab is an event organized by Troyka Innovation for a commerial client. The purpose of an innovation-action lab is to develop out of-the box concepts using the brainpower and experience of the people in the room. This approach works effectively, generates many ideas of which some will be very original. 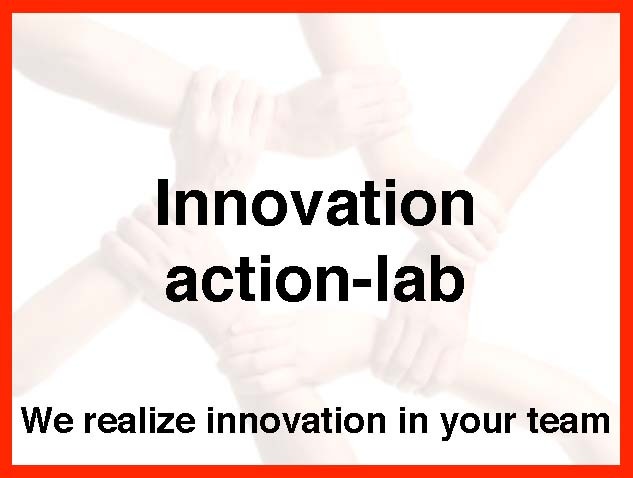 Innovation action-lab is suitable for project teams that are working on some kind of new product, a new design, a new process, a new apparatus. The action-lab is ususally conducted as a two-day workshop. The objective of the action-lab is agreed upfront with the client; this sets the goal of the action-lab. Troyka Innovation designes a workshop event that is tailored towards attacking the client problem from several sides using TRIZ techniques. areas relevant for solving the problem. The group of participants should be as diverse as possible, with respect to experience, age and perspective on the problem. The tangible outcome of an invention-action lab can range from patentable ideas, new conceptual design, improvements to existing designs. The outcome can therefore be very valuable. Troyka Innovation recognizes these commercial sensitivities, and acts prudently to protect the interests of the client. More on this is described in the section Contact (how we work). I am impressed in what an innovation action lab brings in just 2 days of focussed effort. The innovation action lab was very interactive and dynamic. It fosters a creative mindset. We got a very different perspective on our problem. You helped us to get loose from the equipment and back into conceptual thinking. The function action diagram we made in the innovation action lab showed us where the “pain” in our system is. It made the interconnections clear, and made us think about beneficial and harmful actions. You motivated us to think out of the box. The way you facilitate is really good. You are enthusiastic in a way that gives energy to the group. TRIZ is a very good thinking pattern. TRIZ provides for me the skeleton on which I can hang my ideas. My biggest take-away was the way of finding solutions with TRIZ (specific question, generic question, generic solution, specific solution); this frames how we should find solutions. The way you facilitated the innovation action lab is very good: you are not dominating, you have good skills to facilitate discussion and good time-keeping. TRIZ is good at the start of an research & development project, and also when a project develops. TRIZ can provide the moderation to a project team to ensure that the R&D project stays within the scope of the project (rather than working in side paths that do not deliver clear benefits, or do not reduce harms visibly). What I really liked about the innovation action lab was that everybody listens to each other and contributes. You are taking us on a journey with TRIZ for our project; it gives the opportunity to evaluate whether we are on the right track with our current project activities. The function analysis diagram that we made was a good tool to simplify our system. The 40 inventive principles helped me to think in a different way and helped me to change my perspective on the problem. Your very positive and energetic behavior has helped us to stay vigilant and productive during the 1.5 day innovation action lab. Rather than you teaching us TRIZ, we applied TRIZ under your guidance. By going through the innovation action-lab process, we solved our problem and, as a bonus, learned to apply TRIZ. I have been in my life to lots of seminars and workshops. You have done the best job I have ever seen to keep us on track and focussed. You are very organized with forms, handouts and guides; this helped me a lot in the TRIZ process. Where can I sign up for the next innovation action-lab?